Thanksgiving is my favorite holiday. It is all about food, family, friends, and tradition. We always have the same menu each year. Family favorites we cannot do without for the day. For me, Thanksgiving starts early with my pumpkin spice coffee in a large mug and the Macy’s Thanksgiving Day parade. I watch it as I cook. In fact, it is the main reason why I have a T.V. in my kitchen! One thing we always have on our menu is mashed potatoes. I have tried to make them healthy through the years-skim milk instead of cream or yogurt instead of sour cream (works well as long as you don’t tell anyone!) One year I did a mash of russet potato and sweet potato. Looked good swirled in the bowl. I loved it, but my family missed the regular mashed spuds. Another year, I dared to do mashed cauliflower, thought I could outsmart the family-no dice. They say you live and learn, so I have learned to just make the mashed potatoes the way my family expects-with roasted garlic and Asiago cheese. I use a ricer for half my potatoes then add to my mashed. Making mashed potatoes for a crowd is easy but I always worry about not having enough. So I make a bunch. Leftover mashed potatoes are a good thing! They have many uses-gnocchi, soup, soup thickener, cakes, puffs, rolls! This is my hubby’s favorite and since he does such a good job as my sous chef in the kitchen-he deserves it! He always seems to crave some meat and potatoes after Thanksgiving and this is a quick fix for a tired cook. 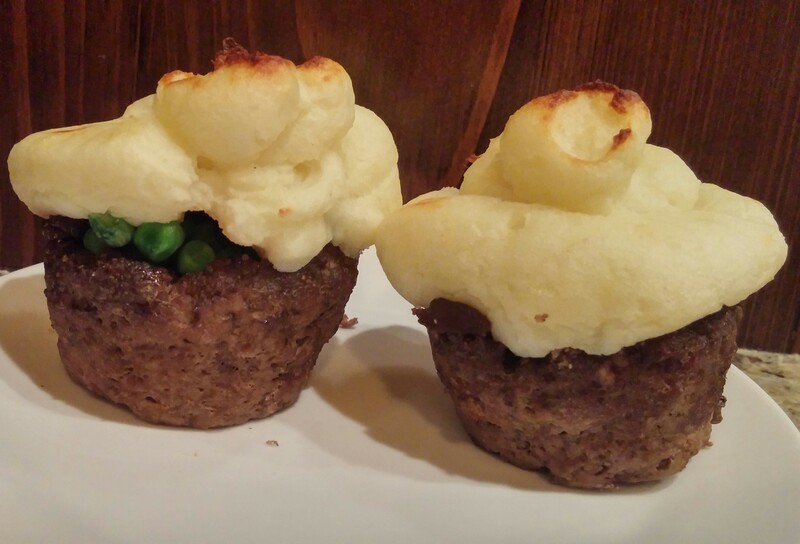 Cottage Pie Muffins: Some call it shepherd’s pie but technically that term is used when the pie contains lamb. Shepherd’s Pie, named for the shepherds that looked over the sheep…think about it for a second…in my opinion that was a job not well done!! A beef pie is considered to be a cottage pie. The term dates back to 1791, when once again a dish was born out of leftovers! I like the term cottage pie. I envision a small quaint stone cottage tucked into a mountainside on a cold afternoon with smoke billowing out the chimney and aromas of seasonings flowing throughout the cottage-comforting thought for me. 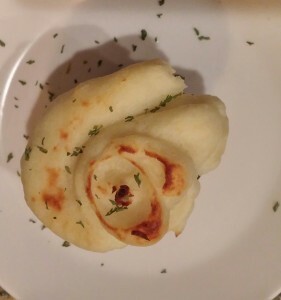 This is a good way to not only use your leftover mashed potatoes but also any vegetables. This recipe can be made with ground turkey (if your not tired of it!) or ground chicken. I like to use lean ground sirloin. Do you have a favorite meatloaf or meatball recipe? You can use it here. Mix your favorites into the beef. Got some gravy leftover-mix a little in your beef. When seasoning, keep in mind what flavors you have in your mashed potatoes and vegetables. I like to add some Worcestershire sauce, black pepper, dash of red wine, and ground french fried onions (you know the ones you have left from that green bean casserole). They work like bread crumbs-remember? Mix all together and form into a muffin tin. 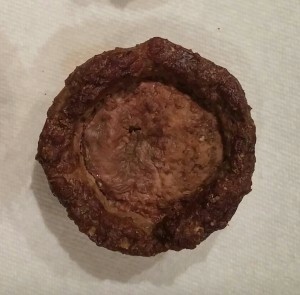 You can use your fingers to press and mold the beef mixture into the tins, but using a measuring cup is quicker. Bake for 350 degree oven for 30 minutes. Drain well. I like to take them out of the muffin tins and set on paper towels. Then they are ready to fill. Use any vegetable you have leftover. 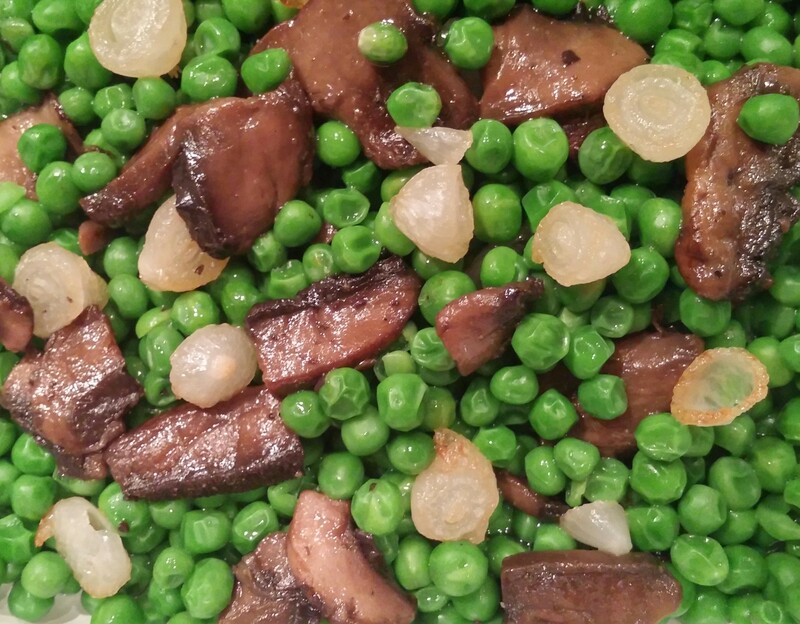 The 3 P’s are always on our Thanksgiving menu-Peas, Pearl onions, Portobellas. That dish came about for most in my family like to mix peas into their mashed potatoes and I felt the need to jazzy up the peas. (If you are one of those people who can’t have their food touch the other food on the plate-I apologize, in fact, if so, this dish probably isn’t for you!). Fill the beef cups with vegetables. Just to note: One pound of beef made six regular size muffins. Put your mashed potatoes into a piping bag…yep, you have one. Take a ziploc bag, put some mashed potatoes into it, squeeze air out, seal it, and cut off a bottom corner forming a tip. Pipe your mashed potatoes onto the cups. If you have a fancy tip and a real piping bag, go ahead, really impress your family and friends. You could also insert the tip into the corner of the bag, then cut corner. If your potatoes are too stiff to pipe, just add a little milk or heat. With potatoes in place like icing on cake, I like to give a quick spray of olive oil (or non-stick spray or some butter) on top to help brown the peaks. (My favorite part!) Put back in oven and bake for five minutes then broil to your liking. 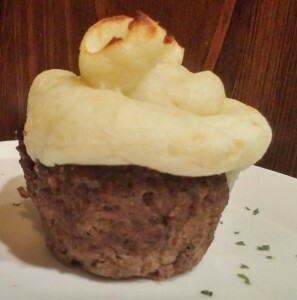 That’s it, your cottage pie muffin is done. Having a dinner party? Easier to serve than a meatloaf or casserole! Need an appetizer, use mini muffin tins! FOOD FUN: When planning your Thanksgiving menu, ask you family “Why” they request or expect certain menu items each year. The answers may surprise you. In fact, you may even be able to remove an item from your menu and add a new one! Susanne, this has Bill’s name all over it! Loves shepherd’s (apologies to the sheep!) pie and I love the twist you gave it. Keep the inspiration coming!! 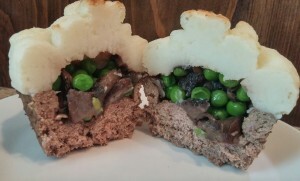 Love your idea for a cottage pie! How delicious……will most definitely try with the Thanksgiving leftovers. I learn something new each week with your blogs. Susanne, you are indeed so creative with food. Everything that I have tried has been truly delicious! Great job!